She is simply adorable & what a great catch of a picture. 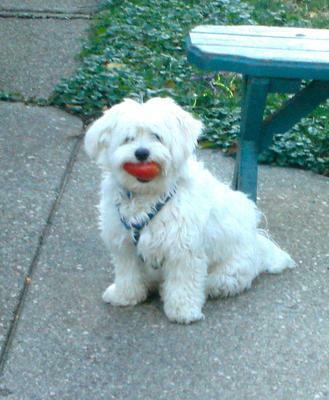 The red tomato reminds me of a picture on this site of a pup that got into a red pen. Thank goodness it did not go splat or did it? What a great picture and aren't you a good little girl to stay posed. I'm thinking if you start eating these its going to be alot of baths. Have you thought about hiding them in the house?? ?...Better not. I find all kinds of things under our bed-candie is on a mission to hide everything she can drag or carry under there. Love your pose! Happy gardening to you! Thanks. She's a character! And such alot of fun. All I can think of is she chomps down on it like Moriarty does with his squeaky toys, tomato all over the place!